Please look at my art work! Please listen to my reflection. This is a historical self portrait of the 19th century. This is my canvas. I painted this to show the season of spring. It tells about how there is lots of land but humans are growing cities all over the world! I drew a blooming tree with a city poking out of the mountains. 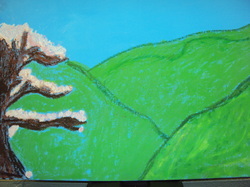 My painting is called Sprinting spring. I used acrylic paint as the medium on my canvas. I used the colors green, brown, and blue mostly in my painting.